I have always been fascinated with what people carry around with them on a day to day basis. Whether you simply carry a wallet, keys, & phone, or if you carry a big bag with you, it’s always been interesting to me. I want to know the specific stuff that people bring with them. What brand of bag is that that guy using? I wonder what’s inside said bag? What specific phone is that lady using? These are the things I wonder when I am people watching. The internet is perfect for supporting this habit of mine. Sites like this one on Flickr (or this one), Timbuk2’s tumblr site, & the editors of the theverge.com’s posts, there are no shortage of places to satisfy my cravings. Today I want to do my own what’s in your bag post. 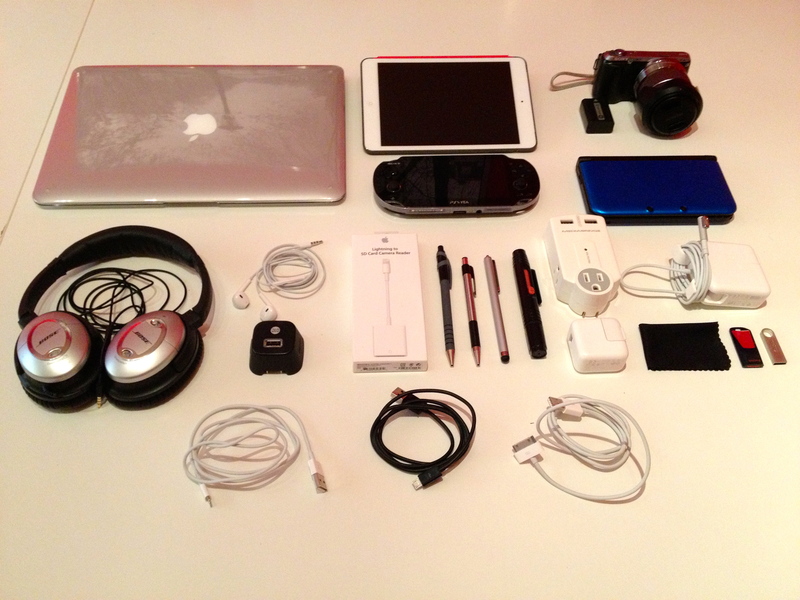 These are the things that I carry with me everyday. I like to be prepared for any kind of situation I might find myself in. What if some emergency comes up & I don’t get to go home for a few days? Do I have all of my chargers for my various devices? What if I need to hit the road at a moments notice? I want to have all of my stuff. So without further ado, here is my bag and the contents within it. First of all the bag itself. 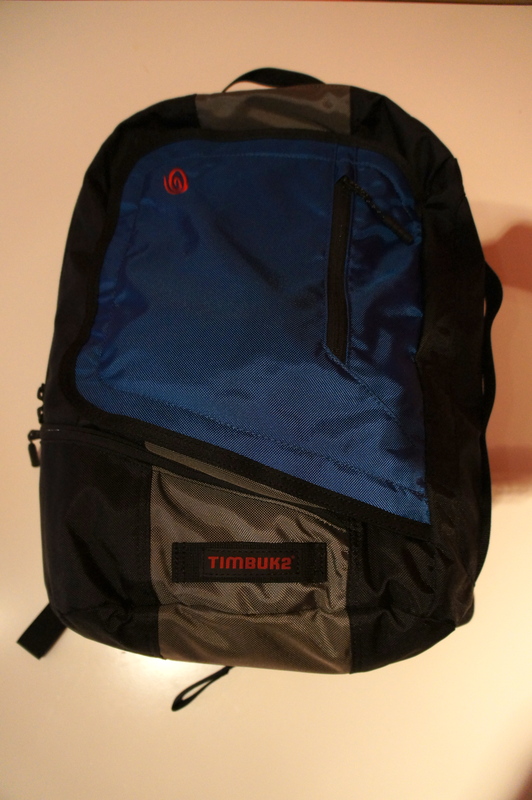 I am currently using a Timbuk2 Q backback which I bought on sale on timbuk2.com a while back. I could not be happier with it. It is super comfortable and has all the necessary pockets & padding that I need. My one gripe is it doesn’t have a water bottle pouch but this is a relatively minor annoyance. 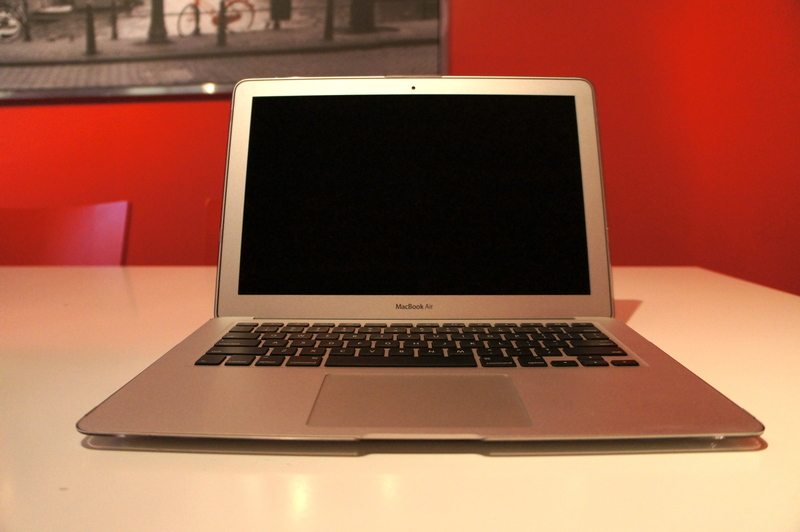 The first item in my bag would have to be my Mid 2011 13″ MacBook Air with a 1.8GHz dual-core Intel i5 and a 128gb ssd drive. This is by far the best computer I have ever owned. It’s incredibly light, has solid battery life, and is more than fast enough for everything I do on it. 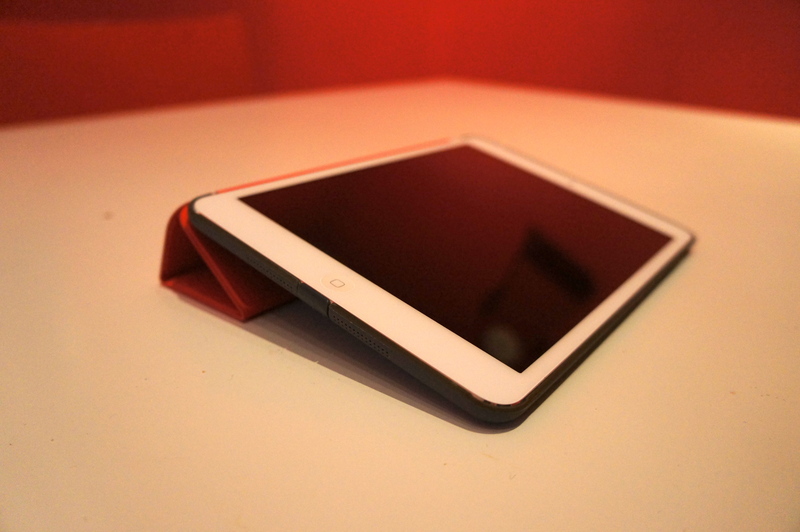 Next would be my 16 gb Verizon LTE iPad mini w/ Red Smart Cover. I have heard the iPad mini described as the best tablet ever. I can definitely see the argument. Insane battery life, the best selection of tablet apps by a mile, & so thin & light it almost seems impossible. The one downside to the mini is the sub par display (non-retina) but I understand that to get the battery life & the thin casing to where it is, this was necessary. Now on to my camera. 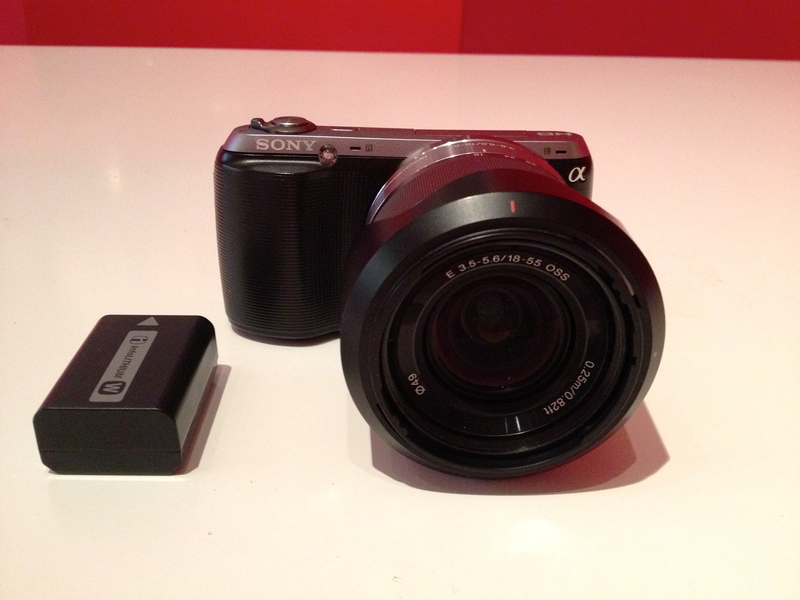 I carry a Sony NEX c3 mirrorless camera with the 18-55mm lens. This is the best camera I have ever used. I got it as an open box item at my local Best Buy about a year ago and it produces some absolutely stunning images, even with my decided lack of camera skills. I am hoping to buy a new lens very soon, specifically the Sigma 30mm f/2.8, but I am pretty happy with the lens it came with. I love mirrorless cameras because you can get dslr caliber images with a much smaller and more portable camera body. I also keep a spare battery for my camera in my bag as well. Next up is my Nintendo 3DS XL. 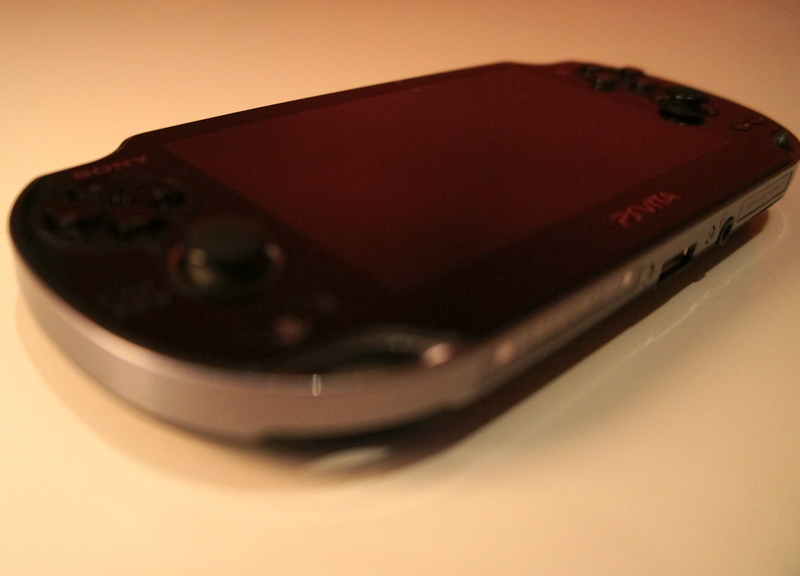 I’m a lifelong gamer and I have always had a soft spot for portable game consoles. The 3DS XL is a great little system. 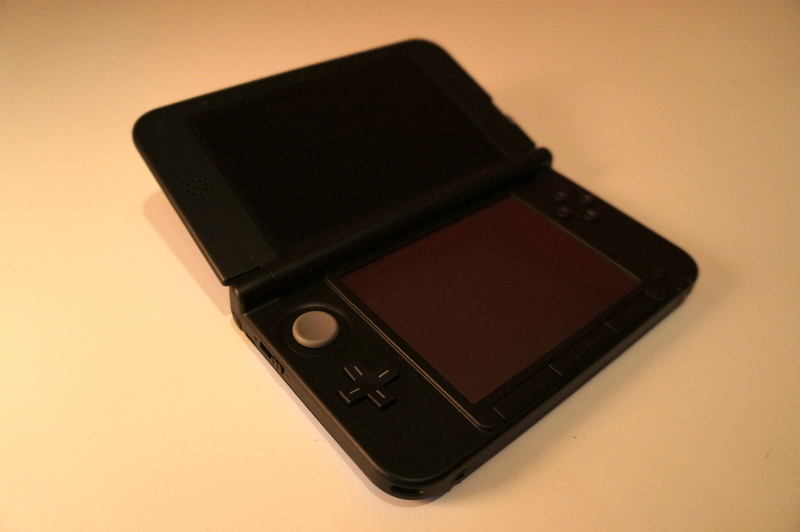 I had the original 3DS and to be honest the battery life & the small screen were not to my liking. Both of these issues have been fixed with the XL and it is a much better system for it. I am currently playing Professor Layton & the Miracle Mask, which is quite good. I also bring my Sony PS Vita with me quite often. This system is very impressive technically (roughly as powerful as the PS3/360) but is suffering from a lack of support unfortunately. I really like mine but there are not a ton of quality games coming out for it. I am currently playing through the excellent Rayman Origins on it. I keep two pairs of headphones in my bag, Apple’s Earpods and my Bose QuietComfort 15 noise cancelling headphones. The Earpods are the ones I use everyday & the Bose QuietComforts are what I use if I need to relax or am travelling. Apple’s EarPods are much improved over their previous ear-buds. 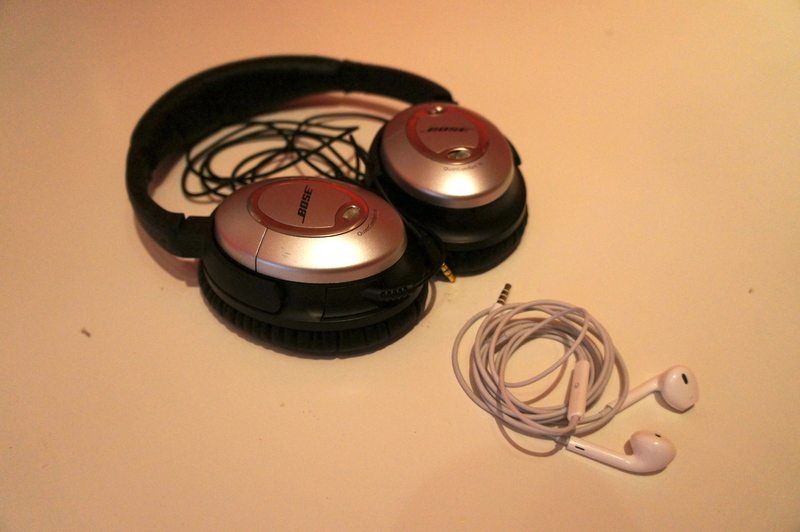 The Bose QuietComforts, which I bought used for less than a third of retail are quite good. They will block out nearly all outside noise, even on a plane. They are also very comfortable. I carry a few chargers with me in my bag – my MacBook charger, a 10w iPad charger for both my iPad & iPhone, & a generic usb charger. I carry various cables with me. 30 pin cable for my iPhone 4s, Lightning cable for my iPad mini, Lightning to SD card adapter for putting my Sony NEX pictures on my iPad mini, & a micro usb cable because you just never know. 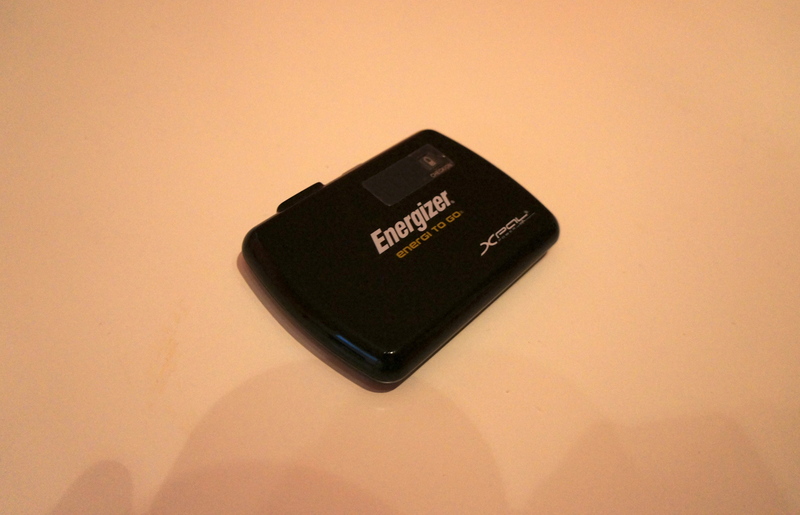 I keep this Energizer battery pack in my bag in case one of my devices is running out of power & I don’t have access to a power outlet. 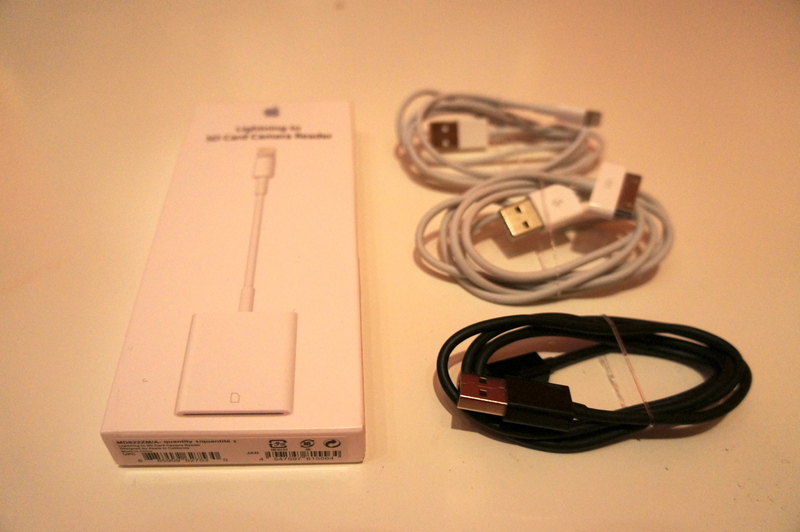 It is very handy & holds a charge for months, which is great. 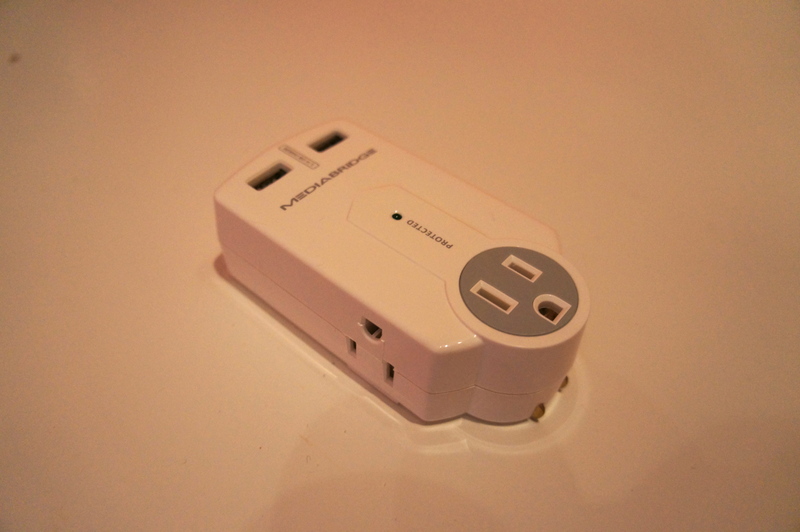 I keep this Mediabridge portable surge protector in my bag for when I do find a power outlet. 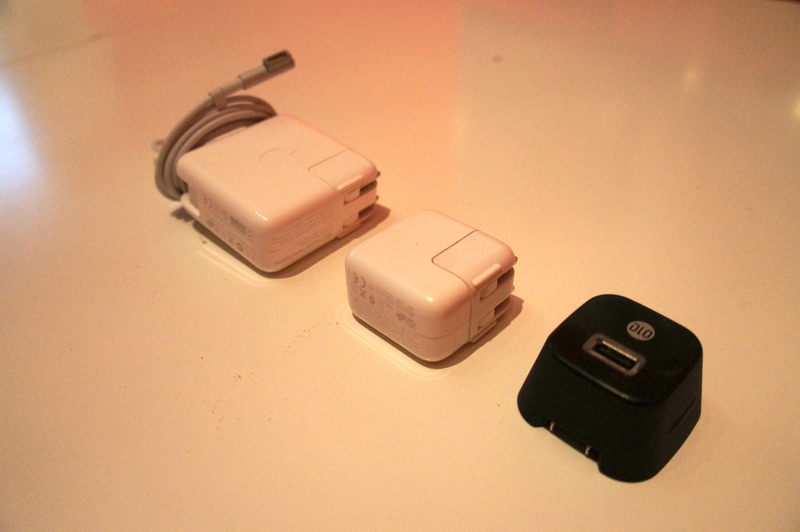 It turns 1 outlet into 3 and adds 2 additional usb chargers. Lastly I keep these various small items in my bag. 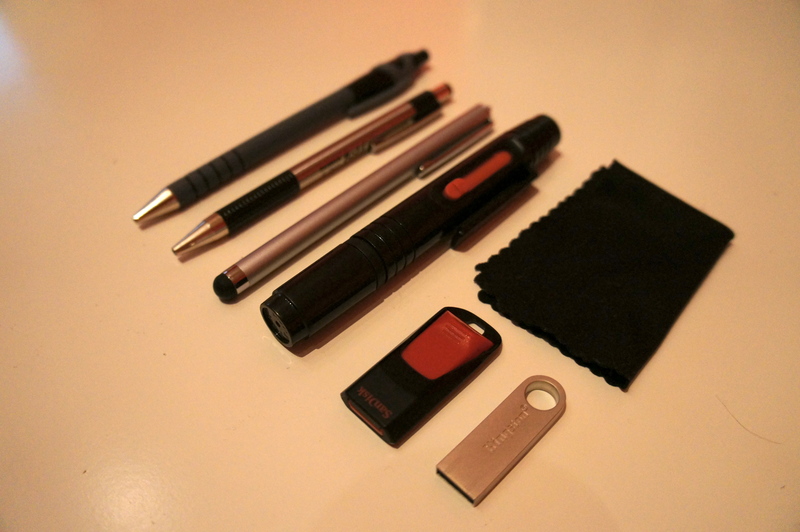 8 & 16 gb flash drives for transferring data, a microfiber cloth for cleaning all of my touch screens, two pens, a stylus, and a camera lens cleaning pen (very handy). So that is what’s in my bag at the moment. Feel free to comment below with what kind of bag you carry with you or the things you like to carry inside it. This entry was posted in Bags and tagged bag, gadgets. Bookmark the permalink.